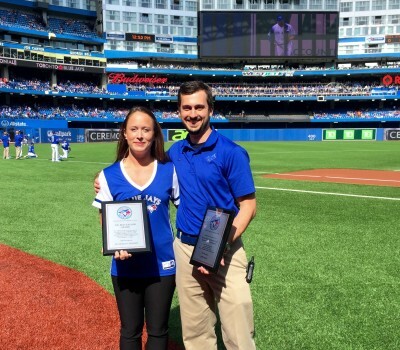 Jacquelyn Ledrew and Joshua Katz, students in Sheridan’s Athletic Therapy program, both received awards on Saturday at a sold out game at the Rogers Centre. 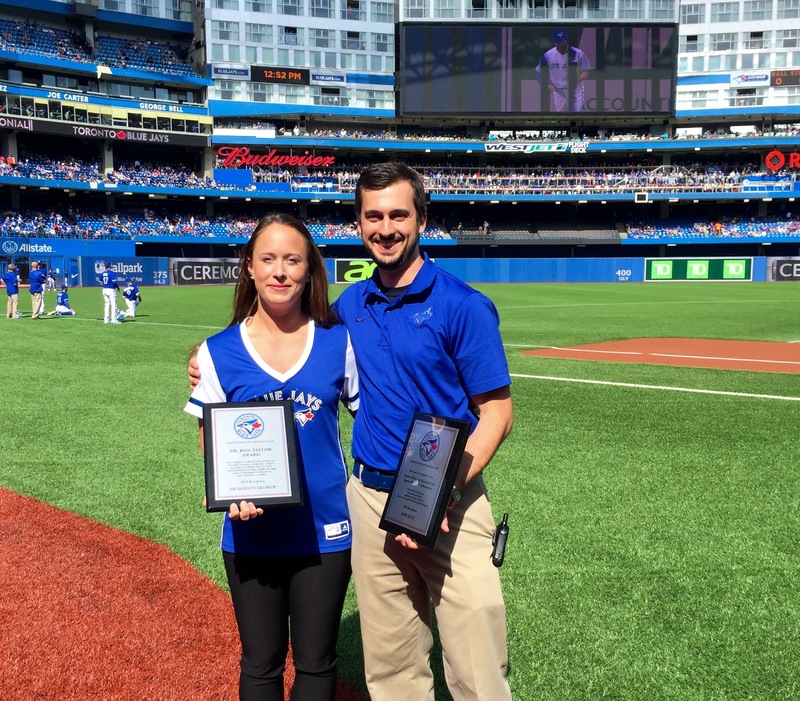 The Toronto Blue Jays honoured Sheridan College Athletic Therapy students Joshua Katz and Jacquelyn Ledrew at a sold-out Rogers Centre on Saturday afternoon. Katz was awarded the 26th annual Sheridan College Sports Medicine Scholarship. As part of the award, Katz spent his summer interning with the Blue Jays, where he worked closely with the team’s athletic training staff and the players while the team was at home. Ledrew, alongside Katz, received the seventh annual Dr. Ron Taylor Award. It is given to the student who demonstrates dedication to their education in athletic therapy as well as leadership qualities through extracurricular activities. Katz got to work side-by-side with 20-plus year medical veteran George Poulis, head athletic trainer of the Blue Jays. For Katz, this internship was more than something to simply put on his resume. It was a dream come true. In preparation for his summer with the Jays, Katz worked with last year’s recipient, Tommy Kratky. According to Kratky, working with the Blue Jays was his “greatest professional experience” ever. Katz’s internship ended on the weekend as the Jays finished their last home stand against the Tampa Bay Rays. Now, he heads into his fourth and final year of Sheridan’s Athletic Therapy program, where he will be able to apply his new skills in the classroom. Following graduation and certification, Katz is unsure about where or how he will take his next step, but Poulis seems to have an idea. “If there were a job opening in the minor leagues, a starter position, he definitely could apply and be a candidate. No doubt,” he said. The internship represents a strong bond between Sheridan College and the Blue Jays for nearly three decades. Sheridan boasts one of the most reputable Athletic Therapy programs in the country. It is a four-year bachelors degree program. “It’s such an exciting program. It is known across the country as one of the best of the best,” said Zabudsky. The college also has relationships with other professional sports organizations, including the Toronto Argonauts and the Hamilton Tiger-Cats. Added by cordellfinn on September 28, 2015.